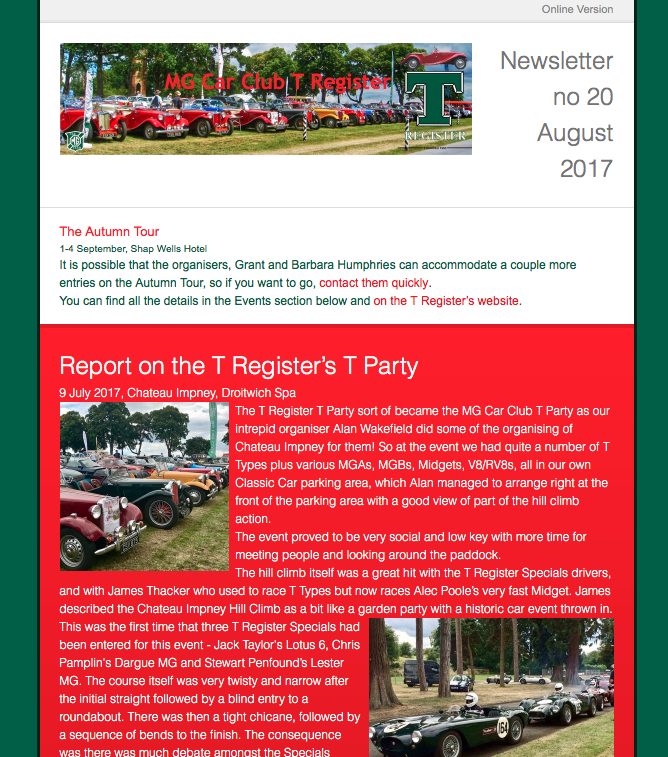 The T Register has a monthly emailed Newsletter for MG Car Club members who own or who have an interest in T Types. It’s a formatted email which is readable on smart phones and tablets as well as laptop and desktop computers. The Newsletter is part of the improvement we are making in communicating with members. Email is a tried and tested means of communication and the majority of our members have an email address. The problem with providing a website or a Facebook Page is that you have deliberately to go to an Internet site to view information; with email, it arrives with all your other emails in a form (we hope) that is easy and quick to scan and digest. The newsletter keeps you informed of what’s going on in the T Register, what’s going on inside the club which is of interest to T Type owners, and also of news about T Types worldwide. It will list T Register events as well as events of interest to T Type owners throughout the UK and major international MG events. It is an additional source of information complementing our website and the T Register Facebook Page, and it contains pointers and links to articles and information in both these places. Want to receive the new T Register email newsletter every month? MG Car Club members and arrives in your email Inbox on the first Monday of every month. It’s readable on all devices, desktop PCs and Macs, laptops, tablets and iPads and all smart phones. It’s snappy and to the point and gives you links to all the information you need to know about what’s going on in the T Type world in one easy to read and attractive email. Saves you searching and visiting all those websites! We would obviously like as many members of the T Register to receive this email Newsletter as possible, but unfortunately we do not possess all the email addresses of all the members. If you, or if you know of any other member outside the recipients who would like to receive the newsletter, please see below. For some members we have two email addresses and so they will get multiple copies of the newsletter. Just let us know which email address you prefer by using any of the methods below. If you do not wish to receive the Newsletter, there is an ‘Unsubscribe’ link at the bottom of every edition of the newsletter. The MG Car Club T Register uses your email address, solely to send you the Newsletter, and your name and MGCC membership number solely to confirm your membership. Your email address may be provided to an approved email distributor.